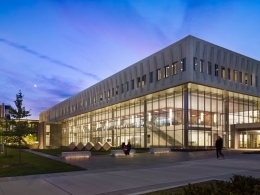 The University at Albany offers its more than 17,300 students the expansive opportunities of a major research university and an environment designed to foster success. Students are instructed by faculty who are world-class scholars and teachers - many actively engaged in life-enhancing research that contributes profoundly to the public good. As mentors, they provide numerous undergraduate and graduate research opportunities, inspiring students to advance their skills and aspirations. The excellence of a UAlbany education is recognized by many independent sources, such as the rankings published yearly by U.S. News and World Report. Its great value results from the world of opportunities that are available to students at an affordable price. The University's location in the state capital of New York provides students with limitless opportunities for internships and public service through which they gain experience, test their skills, and prepare to launch brilliant careers. The region is also a vibrant center for culture and entertainment. Among its attractions are the New York State Museum and Library and the Times Union Center, a major Northeast entertainment and sports venue. Close by are the Berkshires, the Catskills, Saratoga, and the Adirondack Mountains, areas famed for recreational and cultural opportunities.